Monday UPDATE UPDATE: Final figures are in as we await Veterans Day numbers — big moviegoing day. Sunday UPDATE: He's no Iron Man. While Thor's second solo outing was – as expected – more fiscally fruitful than his first, the Norse god's mighty hammer has not the all-inclusive appeal of Tony Stark's shimmering suit of flying metal. Debuting some $40M lower than Iron Man 2, and nearly $90M shy of Iron Man 3, Thor: The Dark World still served its purpose — keeping The Avengers torch lit until the superhero sextet's summer 2015 reunion. Fanboys assemble. 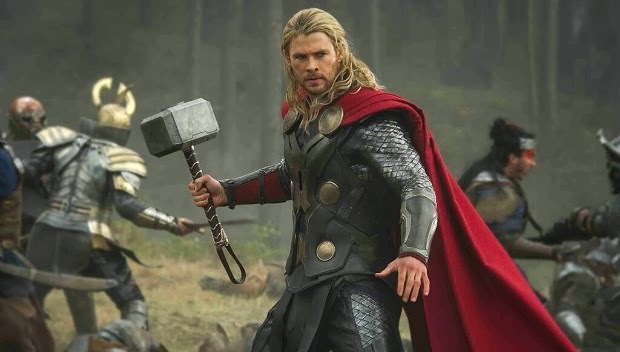 16.66% of the superhero supergroup The Avengers swings onto the big screen this weekend for his second solo outing as Thor and his mighty hammer smash up the joint, seeking a spot on the all-time November openings. While the Norse god will undoubtedly make the month's top ten, breaking the magical $100M mark is no lock, Thor's arguably the dullest member of The Avengers cinematic sextet not monikered Hawkeye. 1. Thor: The Dark World $91.5M (↔) – 2011's Kenneth Branagh-helmed original bowed to $65M but that was pre-Avengers, the post-Avengers world should provide a bountiful bump. 2. Jackass Presents: Bad Grandpa $12.5M – Dipped a scant 38% weekend-to-weekend behind shockingly-strong word of mouth. 3. Ender's Game $12.25M – Planned sequels very much in doubt after less-than-stellar debut. 4. Last Vegas $10.25M – Seniors, nothing but seniors. 5. Free Birds $10M – This turkey scored the worst animated debut of 2013.